LOS ANGELES -- Yasiel Puig's homer stole the show early against his former Los Angeles teammates. But Joc Pederson had the last word for the Dodgers. Puig made his presence felt immediately, hammering a two-run shot -- his 50th career blast at Dodger Stadium -- in the first off Kershaw that gave the Reds a 2-0 lead. Puig received a mix of boos and cheers. Bellinger leads the NL with nine homers, 22 runs, 22 RBI and a .424 batting average. 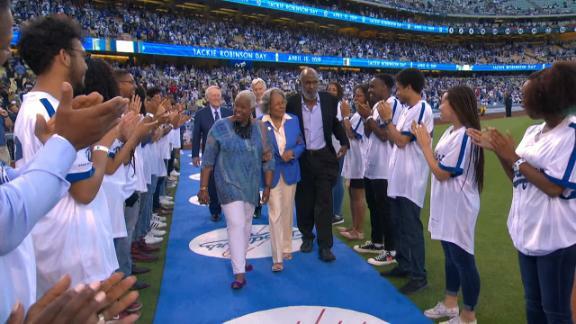 Jackie Robinson's wife, Rachel, and children, Sharon and David, walk on to the field together to throw the first pitches before Reds vs. Dodgers.